Cottage Shutters can be found on old Canadian, American or European cottages in the forests and provide a very unique look for your home. They come in many different colors and materials, and they also provide privacy to homeowners. They serve as another layer of covering for the window openings and add to the overall insulation value of your home. These shutters can be used to cover not only windows but also doors, particularly those that have glass in them. Cottage shutters are usually made of wood in order to provide windows and doors a solid and stable covering to protect the glass from elements that can damage or break them. These shutters deflect any unwanted objects from completely hitting the glass and entering homes. Small rocks, dust particles and other flying debris can easily break a glass window. Cottage shutter’s countryside look gives a refreshing view from outside the home. Wooden cottage shutters are usually built with artistic designs in order for them to have a forest inspired motif. These shutters are built with a design that makes homes look like those cottages from the countryside or those from the remote forests. Their renaissance appearance is also attractive as the shutter looks like those of the 18th century cottages, which were classical and completely made of wood. Classical design is attractive and makes a home look better because of its style. 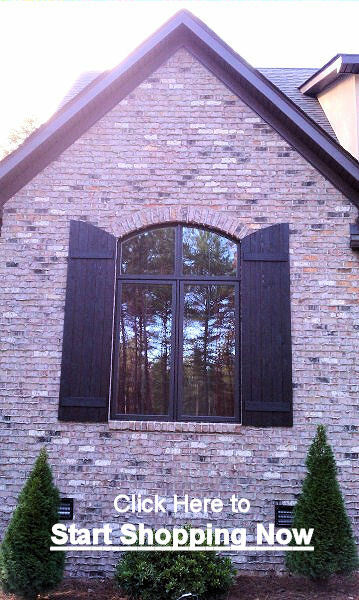 Cottage shutters can be installed on the interior or exterior of your home. Many people like the convenience of opening and closing their shutters from the inside. Of course, if they are installed on the inside, they will not be seen from the outside. So it really comes down to whether you prefer the convenience of closing them from the inside or the beauty they add when installing them on the outside. These shutters are swung inside the house in order to allow light to enter the room and to gain access to the windows. They have louvers which can be rotated or closed in order to control the flow of sunlight and air. Shutters could have a single tier in order for it to control all the shutters. Or, they can have multiple tiers to control just a particular shutter in order for it to be opened individually without opening the other shutters. Exterior cottage shutters are constructed for the purpose of privacy and protection from bad weather or any other disturbances. They are located on both sides of the window and are designed to be closed easily in necessary situations. Exterior shutters also prevent rainwater, filter the sunlight and prevent dust or debris from entering your home. They also help control sunlight and the flow of air for proper ventilation. For more information and to order your new cottage style shutters, please visit our exterior wood shutters page or call to speak with one of our shutter specialists.